Mangaluru, Nov 30, 2015 : Actors being public figures have to be careful and choose their words wisely. 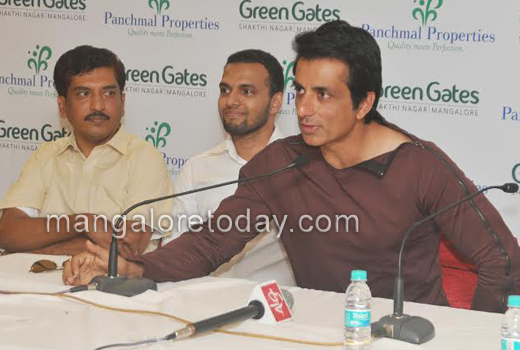 But once you have expressed your thoughts, it’s better to forget and move on, actor Sonu Sood has said. When asked about the controversy following actor Aamir Khan’s statement regarding intolerance, Mr. Sood on Sunday said many times actors generally express their feelings about the happenings in the country. “When you (media) ask us, we generally express our feelings,” he said. Such statements get highlighted and get blown out of proportion, he said, adding that “things do get out of hand”. Mr. Sood said, actors should be careful about what they speak in public. Mr. Sood said he was presently shooting with Jackie Chan for Hollywood movie Kung Fu Yoga . “I have grown up watching his (Jackie Chan) movies. He said he was happy to work with such a nice man in one of the costliest Hollywood production. Asked about his role, he said, “It’s too early to define it. But whatever I do (in the film) all Indians will be proud of it,” he said. Mr. Sood said he was buying a flat in the Green Gates, which, he said, will be used by him as a vacation spot away from the busy Mumbai. He had no qualms in mixing with people, which, he said, keeps him connected with public. He was in the city to lay the foundation stone for a new gated residential project ‘Green Gates’ coming up in 3.5 acres of land in Shaktinagar on Sunday. As many as 276 flats ranging from 670 sq. ft. to 1,795 sq. ft. are coming up in four residential blocks in Green Gates of Mangaluru-based Pachmal Properties. The project is likely to be completed by 2018. Sood will surely experience Mumbai is busy and the peopl hardly get time for gossip from busy schedule but Mangloareans get lot of leisure to interfere in others matters. Unnecssary Rivals. Sood might run away from Mangalore because the people are good, humble, polite but their way of thinking becomes a head ache to others. If he plans to setlle in Mangalore he will run away very soon . Main reason MORAL POLICY. Ofcourse the actors have to be careful about their comments. Sonu Sood is the best actor in negative role .He is highly talented.